, posting behind-the-scenes videos from his show, and answering viewer questions directly using our Moderator platform. In the one-hour session, the “Silver Fox” (as he’s affectionately known online) answered some of your top-voted questions submitted online. Anderson’s visit was part of our @YouTube Talks series, which brings authors, musicians, innovators, and other thought leaders to YouTube for talks centered on their recent work. The goal is to capture the cultural zeitgeist of the day through interviews, presentations, and intimate studio sessions --- and give you access to these minds by opening up the sessions for viewer questions. Stay tuned for more @YouTube Talks! Steve Grove, Head of News and Politics, YouTube, recently watched "Anderson in Times Square." 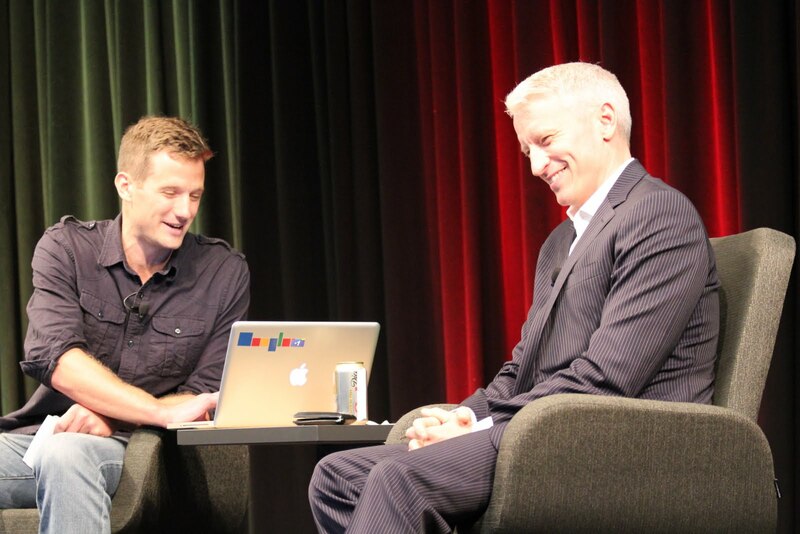 Earlier this week, we welcomed Anderson Cooper to our New York office for a lively question-and-answer session. As he prepares to launch his new daytime talk show on September 12, Anderson has made a big splash on YouTube, posting behind-the-scenes videos from his show, and answering viewer questions directly using our Moderator platform. In the one-hour session, the “Silver Fox” (as he’s affectionately known online) answered some of your top-voted questions submitted online.